Aspartame—the artificial sweetener found in drinks like Diet Coke—is probably not good for you. If you believe otherwise, I admire your commitment to self-delusion. A new study published by a team of investigators at Massachusetts General Hospital in Applied Physiology, Nutrition and Metabolism found a possible reason aspartame doesn’t help you lose weight—oh sorry, haven’t you heard? Like most things in society, diet soda is probably a giant scam. Dr. Hodin and his team found that the artificial sweetener inhibits intestinal alkaline phosphatase (IAP), which is a gut enzyme that researchers believe prevents obesity. So even though there’s no sugar in your diet beverage, it might not aid you in your weight loss journey. To test out aspartame’s effect on IAP, researchers examined four groups of mice over a four-week period. Scientists fed two groups a high-fat diet—one received drinking water spiked with aspartame, while the other had plain water. The remaining two groups were fed normal diets—one with aspartame water, the other with plain. Mice drinking aspartame-spiked water consumed the equivalent of three and a half cans of diet soda per day. Researchers found “while there was little difference between the weights of the two groups fed a normal diet, mice on a high-fat diet that received aspartame gained more weight than did those on the same diet that received plain water.” Furthermore, mice who received aspartame water had higher blood pressure and higher blood sugar levels, which researchers believe is evidence of a glucose intolerance. 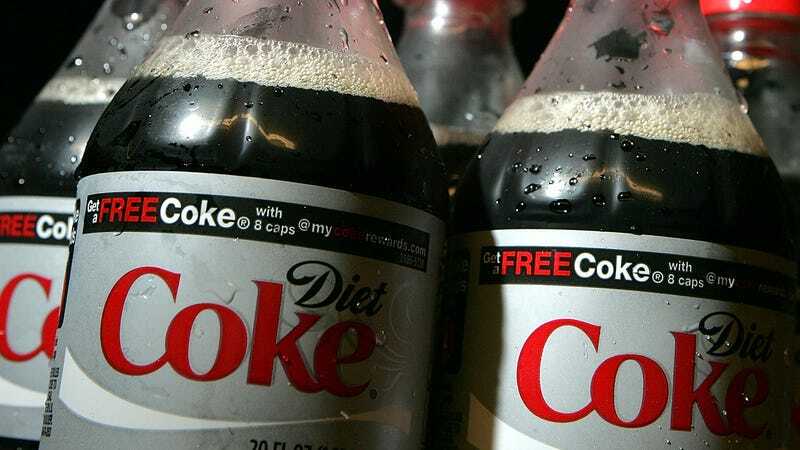 “Both aspartame-receiving groups had higher levels of the inflammatory protein TNF-alpha in their blood, which suggests the kind of systemic inflammation associated with metabolic syndrome,” Science Daily reported. Does this mean I’ll finally stop drinking Diet Coke? No way. But at least now I know what will likely contribute to my premature death.